**PENDING** 2009 Winnebago Destination 37G Double Slide Outs Cummins 340HP Turbo Diesel Full Body Paint***89,990*** Freightliner XC Full Air Chassis, Cummins ISB 6.7L 340HP Turbo Diesel Engine, Engine Brake, Allision 6 Speed Automatic Transmission, 6.0KW Quiet Diesel Generator, Power Gear Power Level Series Levelers, Side & Back Up Cameras With Monitor, Battery Boost, Inverter, Private Rear Bedroom With Wood Sliding Door, Island Style Walk Around Queen Size Bed with Built In Night Stands, Spacious Bedroom With Slide Out, Full Size Mirrored Door Wardrobe, Under Bed Storage Area, Jensen Flat Screen TV, Jensen DVD/CD/MP3/AUX/CD/AM/FM Stereo, Enclosed Private Bathroom With Foot Flushing Porcelain Toilet, Separate Vanity & Sink, Corner Enclosed Shower With Seat, Power Vent, 4 Door Raised Wood Paneled Fridge With Auto Ice Maker, Solid Surface Countertops With Matching Stove & Sink Covers, 3 Burner Stove, 2 Sided Stainless Steel Residential Size Sink, Sharp Insight Residential Size Convection Microwave Oven, Mirrored Backsplash, Power Vent, Drivers Side Slide With Ultra Leather Convertible Sofa & Convertible Booth Style Dinette, Passenger Side Ultra Leather Chair With Ottoman, Jensen Flat Screen TV, Sleeps 6, Tile Like Flooring In Kitchen & Bathroom, Carpet In Living Room & Bedroom, Night Shades Throughout, Jensen CD/AM/FM/Sirius Ready/AUX Stereo, Driver & Passenger Ultra Leather Captian’s Chairs Slide/Swivel/Recline, Cruise Control, Air Horn, Remote Generator Button In Cab, 2 AC Units, Power Step, Porch Light, Power Patio Awnings With Wind Sensor, Outdoor Shower In Utility Cabinet, Tow Package, Rear Roof Access Ladder, Compartment Lights, Fog Lights, Power Heated Mirrors, Driver’s Side Slide Lock, 92 Gallon Fresh Water Tank, Docking Lamps, Air Horn, Only***89,990***We have some fantastic financing and take trades also! It is our #1 goal that your experience with our company is an enjoyable one with our staff of industry professionals, Conejo Wholesale Auto & RV, Exclusive Dynamax Dealer for Ventura County, We Also Carry a Large Inventory of Winnebago Navion, Revels and Winnebago Touring Coach Era Motorhomes, 661 E. Thousand Oaks Blvd, Thousand Oaks, CA 91360, 805-496-8700, Open 7 Days, 9am to 6pm, All Coaches Fully Inspected, Serviced and Detailed, Come Experience the No Pressure No Haggle Sales Approach at Conejo RV, We Also Buy Clean Late Model Coaches (***plus tax & license fees***) 1 Year Camping Membership Included In Purchase Ask For Details! 2009 Winnebago Destination 39W, 2009 Winnebago Destination 39W Define your interior. Maybe you love the power of diesel. Or perhaps you prefer the convenience of gas. Whichever engine you prefer, you’ll love the Winnebago Destination®. It’s built on your choice of a Freightliner® XC chassis with a Cummins® 340-hp turbo-diesel engine or the available Workhorse™ UFO gas pusher chassis with a 340-hp GM Vortec™ engine (NA 39N). The Destination comes in three distinct models, including the new 39N with a front entry and a full-wall slideroom. With SmartSpace™ amenities making the most of the available space and a 7'2" ceiling height creating a roomy and open feel, the 2009 Winnebago Destination is a place you’ll love to call home. 2017 Winnebago Destination 36RL, Stock #173860 - 2017 DESTINATION BY WINNEBAGO 5TH WHEEL BOASTS A KING BED, 3 SLIDES, & PLENTY OF SPACE FOR FULL TIME LIVING! We are looking for people all over the country who share our love for boats/RVs. If you have a passion for our product and like the idea of working from home, please visit SellBoatsAndRVs [dot] com to learn more. This listing has now been on the market 30 days. If you are thinking of making an offer, go ahead and submit it today! Let's make a deal! Reason for selling is not using anymore. Kitchen Island, Microwave/convection Oven, Pantry, Refrigerator/freezer (LG Residential), Dinette, Cabinets, Counter Backsplash, Double Kitchen Sink, Oven, Stove, Hood Fan, TV ((3)), Interior Lighting, Optional Theater Seating, Bluetooth/aux., CD Player, Digital TV Antenna (Jack), DVD Player, Exterior TV Source, Stereo System, Power Charging Center, Surround Sound System, Air Conditioning, Bathroom Sink, Bed - King (Power Reclining), Fireplace, Shower, Skylight, Slide-out ((3)), Clothes Dryer, Clothes Washer, Ceiling Fan, Carpet, Cedar Lined Closet, Ceiling Vents (W/rain/temp Sensor), Dining Table W/chairs ((4) Chairs, 2 Are Folding), Flooring (Vinyl/carpet), Keyless Entry, Recliner - Stadium Style (Theater Seating), Sofa Sleeper, Tinted Windows, USB Charging Port, Water Filtration System, Water Heater (10 Gal. ), Windows- Day Night Shades, 110 Lighting, 110 Outlets, Batteries - House ((3) In Slide Out Tray! ), Cameras (Rear View Camera), City Water Hook Up, Electric Panel, Generator Pre-wire, Heated Basement Storage (Winter Package), Power Cord (Power Wind For Cord), Power Jacks, Tire Date Code (Goodyear, Sept '17), Water Filter, Inverter (CSW1012), Automatic Leveling Jacks, Awning - Patio ((2) Power), Automatic Steps, Entry Assist Grab Handle, Exterior Speakers, Exterior TV, Flush Mount Windows, Propane Tanks ((2)), Roof Access Ladder, Exterior 110 Outlet, Porch Light, Back Up Camera, CO2 Detector, Emergency Exit, Running Lights, Smoke Detector, Spare Tire Kit, Fiberglass Construction, 2-Axle, Waste capacity: 33 gals, Gray water capacity: 66 gals, Width: 8' 4", Height: 13' 3" "2017 DESTINATION BY WINNEBAGO 5TH WHEEL BOASTS A KING BED, 3 SLIDES, & PLENTY OF SPACE FOR FULL TIME LIVING!"  2015 Pre-owned Winnebago DESTINATION 36RL Fifth Wheel in Texas. This unit has it all! This unit is immaculate. Only been pulled less than 5000 miles!!! We are Non-Smokers. Must see to believe! 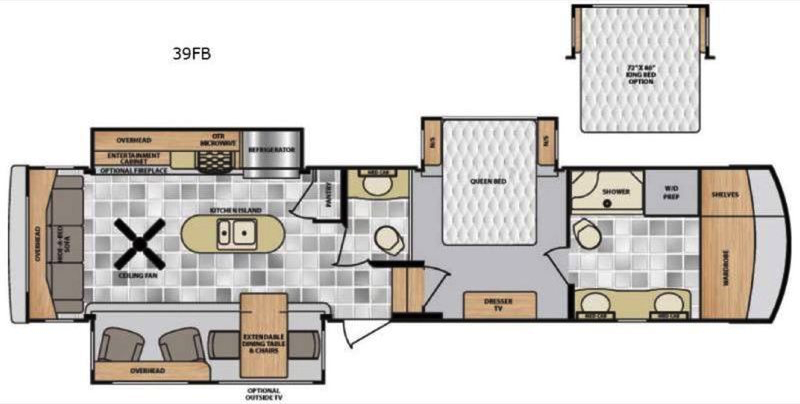 This floorplan has an exceptional amount of storage, making it very desirable for full time RVing or long travels away from home. It comes standard with 1 sofa that folds out to a queen size bed and 2 additional recliners. A large flat screen TV with DVD and surround sound system in the living area. It will take the chill off of those cold mornings. The kitchen features a full-size residential stainless steel refrigerator, pantry, a stainless steel 3 burner stove, oven and convection microwave, and an island with double stainless steel sink with lots of storage. The dining room features a free-standing dinette with table extension and 4 chairs. The bathroom features a spacious shower with bench and additional storage. The bedroom features a king size bed with an electric tilt up and down and underneath storage. The MBR has a unique flat screen TV hidden behind the mirror in the dresser, largedresser, washer/dryer connection, and a large master/mirrored closet with lots of storage. This unit features many cubic feet of storage in the front basement area. Front cap has one minor scratch damage spot. * Extreme Weather Pkg * 6 Point Hydraulic Auto Leveling * Fireplace * Residential Stainless Steel Refrigerator with ice maker* 2nd 13.5 BTU A/C * Electric cord reel for 50 amp electric cord* Bluetooth connection for outdoor speakers* Outdoor TV jack connection* Power Vent Fan in Bathroom * Theater seating recliners * 55" TV in living area* 42" TV in MBR* RVLock keyless entry* Generator connection and storage area in basement* Electric awning with LED lighting underneath* LED accent lighting on front cap * Blue LED accent lighting in kitchen and living area* RAIN SENSOR power vent in the kitchen* Washer and Dryer connections* Cordless Dyson Vacuum* Convection Microwave* Heated Water and Wastewater TanksMiscellaneous additional items, including but not limited to: Wheel Chocks; six-point pads; 25’ sewer hose; large outdoor mat and miscellaneous mats; collapseable metal stair step. Too many extras to list. It's loaded and ready to go. B&W fifth wheel hitch available upon request and will be in addition to the list price of the trailer. The total 2015 list was over $99,000. 2008 Winnebago Destination 39W, Call for details. 2008 Winnebago Destination 37G, Double Slide Class A, Rear Queen Bed w/Night Stands, Wardrobe/Storage Cabinet Slideout, Stool Room w/Storage, 30 In. TV, Booth Dinette & Sofa Bed Slideout or Round Dining Table & Chairs w/Sofa Sleeper, Euro Chair w/Ottoman, Corner End Table Cabinet, Double Kitchen Sink, 3 Burner Range, Refrigerator, Pantry, Angle Shower, Overhead Storage Cabinets, Optional Freightliner Chassis, and Much More. 2008 Winnebago Destination 39W, Double Slide, Bedroom & Galley Slideout w/Queen or Opt. King Bed/Nightstands/Wardrobe/Pantry/Refrigerator w/4 Door Opt./3 Burner Range & Double Kitchen Sink Super Slide, Euro Chair w/Ottoman, Corner End Table Cabinet, Booth Dinette or Opt. Round Dinette & Chairs w/Sofa Bed Slideout, 30" TV, Angle Shower, Lav., Med. Cabinet, Double Bath Entrance, Bench Seat Storage in Bedroom & Opt. Washer/Dryer, Opt. Freightliner Chassis and Much More. 2008 Winnebago Destination 37G Gas Pusher, Workhorse UFO ChassisRear Engine Gas Pusher on Chevy 8.1L Vortec V8, less than 10,200 original miles, kept in a garage, 9.5/10 condition inside and out. Large electric patio awning, full body paint (silver sky), two large slide outs with awning toppers, cold and ducted air conditioning, AM/FM stereo, auto leveling jacks, cd player, large microwave/convection oven, two LCD TVs, three burner stove, forced floor heat, 50amp service, large 26,000 pound chassis! Propane electric refrigerator and freezer, 6 way adjustable seat and adjustable gas and brake pedals, back up camera and side cameras, tow hitch, huge 5500 Onan generator with only 73 hours, rooftop solar panel, smooth fiberglass exterior, washer dryer hook-ups, large wardrobe, captain’s chair, walk around 60x80 residential queen bed, lots of counter space, two electric entry steps, window shades, sleeps 4, angled glass shower, porcelain toilet, sofa sleeper, free standing dinette, one Piece Fiberglass Roof, basement storage, roof ladder, dual pane windows, assisted Braking, air ride suspension and much more! This is a super clean motorhome in great condition!! Winnebago makes a great class A come by and see. Save tens of thousands of dollars off a new one. Experience life in this great RV!!!! 2008 Winnebago Destination 39W DESTINATION DIESEL PUSHER, "Destination", similar to a "Journey" by Winnebago, 39 foot, , huge passenger-side slide-out. Freightliner chassis, 340 hp Cummins, newly arrived. MORE PICTURES TO COME 2008 Winnebago Destination 39W You’ve found your Destination. There’s a new breed of Class A motor homes hitting the road and the 2008 Winnebago Destination™ leads the way, giving you the option of a gas pusher or diesel pusher chassis. It’s the fi rst coach to take full advantage of the all-new Workhorse UFO™ gas chassis and its powerful 8.1L, 340-hp rear engine. You can also choose the Freightliner® XC diesel chassis with a Cummins® 6.7L ISB diesel engine. Two innovative models are loaded with storage and contemporary features like beautiful curved cabinetry and a 7'2.5" ceiling height. For more power and more fun, make plans for a Winnebago Destination. 2008 Winnebago Destination 39W, 2008 Winnebago Destination 39W You’ve found your Destination. There’s a new breed of Class A motor homes hitting the road and the 2008 Winnebago Destination™ leads the way. It is loaded with storage and contemporary features like beautiful curved cabinetry and a 7'2.5" ceiling height. For more power and more fun, make plans for a Winnebago Destination. Come see this very popular floorplan with all the right equipment like, PARTIAL PAINT TRUEAIR RESIDENTIAL A/C AUTO LEVELING SYSTEM 4 DOOR RV REFRIGERATOR TV IN LIVING AREA TV IN BEDROOM QUEEN BED ONAN 6000 DIESEL GENERATOR SLIDE TOPPERS BACK UP AND SIDE CAMERA SYSTEM For our best price ask for Tom, Internet Sales Manager at (928) 846-0505 AVAILABLE FOR SALE AT SUNSHINE RV. FAMILY OWNED AND OPERATED FOR OVER 25 YEARS. COME SEE THE LARGEST SELECTION OF NEW AND USED TRAVEL TRAILERS, LUXURY 5TH WHEELS, TOYHAULERS AND MOTOR HOMES AVAILABLE IN THE TRI-STATE AREA. Financing is available on approved credit. With multiple lenders to work with, we can offer the lowest rates and longest terms. We offer a secure online credit application for fast and easy credit approval. Sunshine RV also offers a variety of extended service plans that are available on most everything we sell. Ask Finance Manager for details.